Melbourne, FL – U.S. Term Limits (USTL), the leader in the national, non-partisan movement to limit terms for elected officials, is gathering support from elected officials across Florida. Its mission is to advocate for term limits on all elected officials. 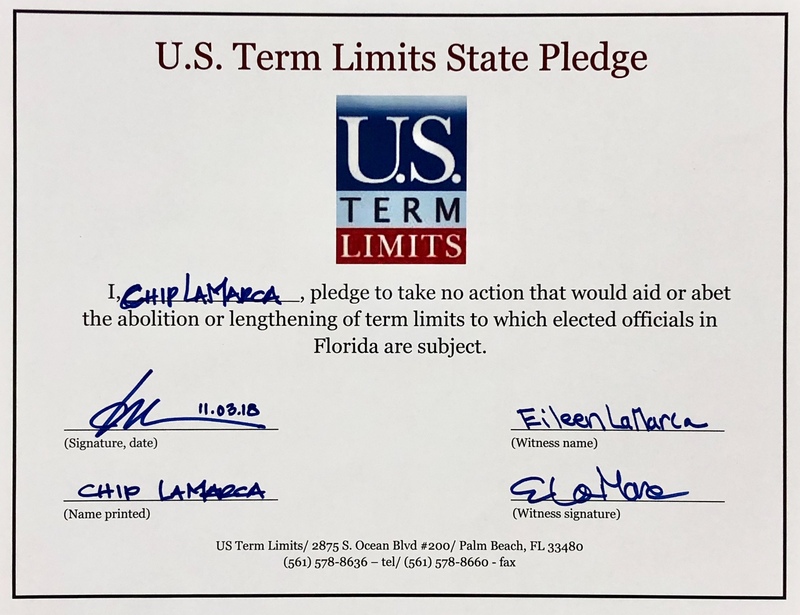 State house candidate, Chip LaMarca of district 93, has committed to defend term limits in Florida by signing the term limits pledge. Term limits have achieved their aims in Florida. While career politicians in states like Illinois and Massachusetts run unopposed more than 50 percent of the time, every single Florida legislator has been opposed in the last two election cycles. Thanks to term limits, Florida also sees remarkably high rates of open seat races and incumbents who face primary challengers. View LaMarca’s signed pledge here.